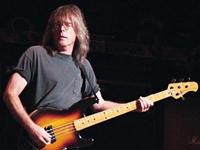 Cliff Williams (born December 14, 1949) is an English bassist, best known for his membership in the Australian hard rock band AC/DC since June 1977 (though he was briefly replaced by Paul Greg during the 1991 world tour). He moved with his family to Liverpool when he was nine, where he spent the first two working years of his life as an engineer before joining his first band, Home. Like his bandmate Brian Johnson, he now lives in Florida. In 1970, Cliff Williams began with his first band, Home, with singer Mick Stubbs, guitarist Laurie Wisefield, keyboardist Clive John and drummer Mick Cook. By 1970 the group’s progressive brand rock music earned them a deal with Epic Records and a debut LP was released the following year under the title Pause For A Hoarse Horse. In November 1971 Home supported Led Zeppelin at the Wembley Empire Pool on the second of Led Zeppelin‘s Electric Magic concerts which featured circus acts as well as rock bands. In 1972, Jim Anderson replaced Clive John on keyboards and Home released a self-titled album, going on to have their one and only hit with Dreamer in November 1972, which peaked at #41 in the UK album charts. Their next album, The Alchemist followed in 1973, but did not gain much success. However, when British folk singer-songwriter Al Stewart suggested Home back him on his first American tour in March 1974, Mick Stubbs left the group. The others became the ‘Al Stewart Band’. The Al Stewart band did not last long, and Cliff Williams was next to leave the group, forming Bandit in 1974. Bandit quickly got a deal with Arista Records and released a self-titled album in 1977. Joining Cliff in this line-up was vocalist Jim Diamond (who went on to success as a solo artist) and drummer Graham Broad (who was later to join Bucks Fizz and Roger Waters’s band). However, Bandit never gained much success, therefore Cliff had no hesitation when he was asked to join AC/DC in 1977. At that time, AC/DC was in need of a bassist after the departure of Mark Evans during the Let There Be Rock tour. Cliff joined the band and helped record AC/DC‘s fifth album, Powerage, the following year. As of 1995′s Ballbreaker, Cliff has been using a Music Man StingRay strung with D’Addario flatwounds. During the early years with AC/DC, he mainly used Precision basses, although during some live performances he used a Fender Jazz bass. For 1980′s Back in Black, it has been speculated that he used a non-reverse Gibson Thunderbird. He used a P bass on For Those About to Rock. For the 1983 album Flick of the Switch (and the tour that supported it), he used a Steinberger. He stuck mainly to P Basses through the 80′s (with the exception of Fly On The Wall, in which he used a Gibson SG re-issue.) On the Razor’s Edge he used a jazz bass. Nothing mentioned here about his amps, but Cliff has been a long time Ampeg user (since at least the Back In Black album) and can be found on the Ampeg endorser list.